Aircraft assigned to Carrier Air Wing (CVW) 14 fill the hangar bay of the Nimitz-class aircraft carrier USS Ronald Reagan (CVN 76) to full capacity for the first time in more than three months, in March 2008. US Navy photo. The Navy will ask Congress for permission to deactivate a carrier air wing, which will save money and boost readiness in other air wings. 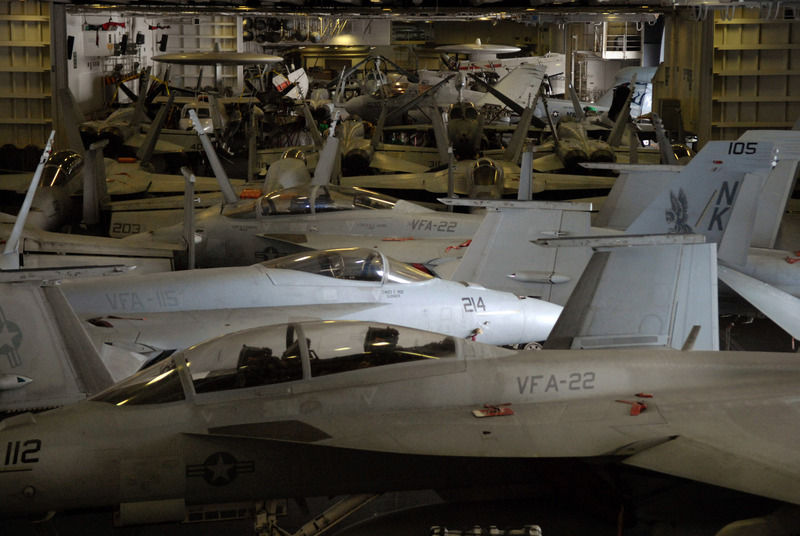 The service wants to shut down Carrier Air Wing Fourteen (CVW-14), which has not deployed since 2011 and has not been fully staffed for the past several years, USNI News understands. The air wing is based in Naval Air Station Lemoore, Calif., and consists of four squadrons. “This proposal will allow the Navy to match the number of air wings to the number of deployable aircraft carriers,” Rear Adm. William Lescher, the deputy assistant secretary of the Navy for budget said in a Tuesday afternoon briefing. Vice Admiral Mike Shoemaker, commander of Naval Air Forces Command, said in a statement provided to USNI News that the move makes the most sense for operational forces. A source familiar with the budget submission told USNI News that the move would save $926 million over the five-year Future Years Defense Program (FYDP) through operational and personnel savings. No personnel would be cut as a direct result of the air wing deactivation; however the Navy plans to reduce the size of the force by 4,400 by the end of Fiscal Year 2017 compared to 2016 through natural attrition, and the air wing deactivation would be one component of decreasing the service’s end strength. The CVW-14 aircraft would be moved to other squadrons, boosting readiness in those squadrons and reducing daily costs of operating and maintaining the planes. The Navy’s Fiscal Year 2017 budget request includes operations and maintenance funding for nine carrier air wings, according to official documents. Today, the Navy has 10 aircraft carriers and 10 carrier air wings. However, for the foreseeable future one aircraft carrier will always be in a four-year Refueling and Complex Overhaul. In the event of war, that carrier could not be brought out of the yard to deploy – so the Navy feels confident it can still meet any surge requirement with just nine air wings, according to the source. In addition to the one carrier in RCOH, there is generally at least one other carrier in deep maintenance, further reducing the ability of carrier air wings to train at sea. In fact, five of the 10 aircraft carriers were in maintenance late last year, leaving only five carriers to deploy and conduct training at sea – and making it harder for the aviators to practice at-sea operations and stay qualified.